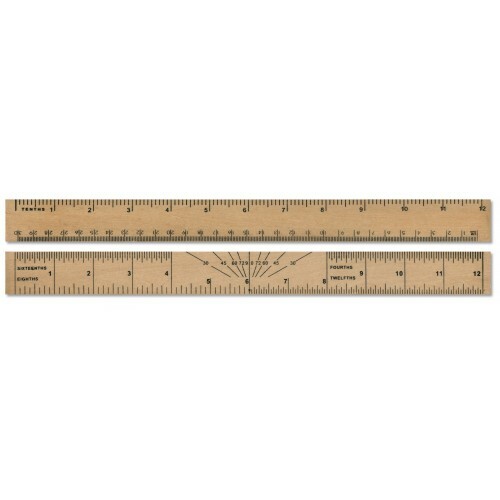 Wooden rulers have never been fully surpassed in popularity by plastic or metal rulers. They offer high levels of durability and are aesthetically appealing, tangible and tactile in form and feel. This wooden ruler is built to a superbly high quality and features a double-sided metric/imperial design that is complete with a protractor. This wooden ruler features a multitude of different scales. It also features extended ends for added convenience when drawing or measuring. It firstly has a 1 to 12” scale that is scored with 1/10” increments. It also has a 1 - 30cm scale divided into mm. The reverse has a 1 - 12” scale divided into 1/4", 1/8" 1/2" and 1/16" scales and a protractor for measuring angles. Wooden rulers are more aesthetically appealing than plastic. They’re simply nicer to use and for school, that’s a big benefit. Wood offers material properties which plastic never can and numerous tests suggest that wood still outguns plastics in many material categories surrounding resistance to scratching, staining, denting and snapping.